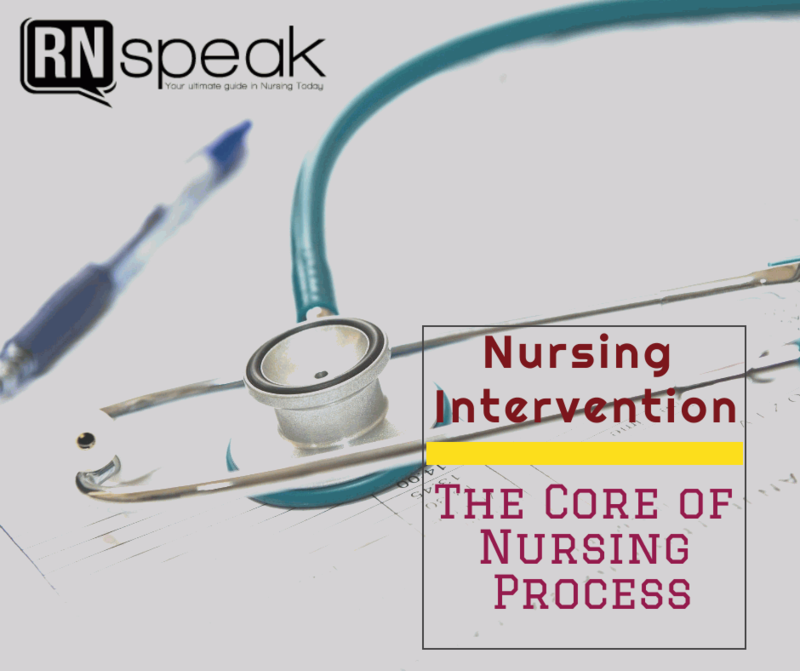 Nursing intervention is the third step, and considered the core, of the nursing care process. Every nurse knows that this is the phase where the appropriate actions are selected and carried out to provide care for the patient. For a lay person, this is when they see nurses sprang to action and respond to emergency situations, or when they give medications and follow doctor’s orders. But amidst in the chaos and when things ebb down, nurses are still working on delivering interventions even if the patient’s condition is not life-threatening. Nursing interventions are not just an instantaneous response of a nurse to alleviate a patient’s present condition nor aid in the recovery of his ailment. Rather, it uses rational and critical thinking skills to come up and choose what nursing actions are relevant and significant to help attain positive patient outcomes. The Oxford dictionary defines intervention as “action taken to improve or help a situation”. It is considered a strategy or planned action to accomplish the desired outcome or goal of a specific situation. Textbook literature defines intervention as “any treatment based upon clinical judgment and knowledge that a nurse performs to enhance patient/client outcomes” (Moorhead, Johnson, Maas, & Swanson, 2018). In the nursing profession, the word intervention refers to planned activities carried out by a nurse to ensure that a patient complain is addressed, doctor’s orders are followed, and coordination with other members of the health care team are in place in order to manage the care of the patient. Nursing intervention should not be confused with nursing assessment. Assessment is the gathering and organizing of data in order to determine what is wrong with the patient. Assessment activities oftentimes overlap during the intervention phase of the nursing process, however, it does not completely focus on intervening or helping the patient’s condition. The words assess, monitor, auscultate, check, and observe allows the nurse to identify whether a specific patient outcome is achieved. Nonetheless, these actions do not highlight or indicate how to achieve the outcome. In order to carry out an intervention, example of the appropriate words to use are administer, educate, position, and provide (Reising, 2016). There are three types of nursing interventions: Dependent, Independent, and Collaborative. Dependent nursing interventions. Also called as physician-initiated interventions, these are activities that require doctor’s orders or directions from other health care professionals. The interventions performed by the nurse are part of the treatment process or medical management of the patient’s medical diagnosis. An example of this is the administration of medications or changing of dressings. directed toward treating or managing a medical diagnosis. A nurse who solely decides and performs interventions under this category is liable to legal implications. Independent nursing interventions. Nurses, as health care professionals, do not completely rely on the medical management in order to provide care to their patients. Overtime, the notion that nurses are doctor’s handmaidens, have drastically changed and empowered nurses to be independent in their own terms. This is where the nurse-initiated interventions come in. Nurses can perform caring interventions without a doctor’s prescription. The acceptable nursing actions have foundations in medical and nursing literature and supported through evidence-based practice research. Collaborative nursing interventions. This pertains to the involvement of other disciplines in the medical management of the patient. A doctor cannot fully treat a patient with breathing problems without the assistance of a respiratory therapist or ensure the complete recovery of an injured patient without the help of a physical therapist. With this, the nurse may perform interdependent interventions in accordance to the directions of each discipline that is in contact with the patient. At times, the nurse convenes and discuss with members of the health care team to guarantee that the plan of care is carried out. Desired patient outcomes. Outcomes are behavioral cues that will describe the patient’s responses, feelings in response to the caring interventions provided. The nurse should state what she does she need her patient to accomplish after an intervention is performed. Outcomes are stated in a specific, measurable, attainable, realistic, and time-bound manner. Nursing diagnosis. Before a nurse can come up with a nursing intervention, the nursing diagnosis should be clearly identified. Since the use of this standardized nursing language in 1970, this provide a concise description of patient problems stating the etiology or cause, related factors and the presenting manifestations. By indicating a nursing diagnosis, there is a correlated nursing intervention to correct these conditions thus improving the state of the patient. In 2015, it was decided by the American Nurses Association (ANA), that nurses are no longer required to complete a nursing diagnosis in the nursing notes and electronic health records to effectively use the much-needed time in patient care rather than documentation and coming up with a pristine nursing diagnosis. This change will not totally affect the decision-making of the nurse when choosing an intervention. Research base for the intervention. This refers to the effectiveness of the intervention when used in certain type of patients. Meaning this nursing action has been clinically tested and proven to benefit patients rather than cause harm or injury. At present, there are 565 interventions and approximately 13,000 activities that a nurse can follow based on Nursing Interventions Classification (NIC) (Moorhead, Johnson, Maas, & Swanson, 2018). Most of these nursing interventions have undergone research for specific populations, whilst others need further investigation and based on expert clinical knowledge. Feasibility for performing the intervention. It is important to note that when selecting an intervention, the nurse must consider how a particular intervention interacts with other interventions provided by members of the health care team. Is it cost-effective at this point, necessary, and timely? Acceptability to the patient. When providing an intervention, the nurse should assess the patient’s personal values, cultural and religious beliefs making sure that it is acceptable and successful in the end. The patient and family should be given a brief explanation on what the intervention can do for the patient, however, it will always be the patient’s decision to follow it or not. Capability of the nurse. This pertains to the nurse’s knowledge of the rationale behind the intervention, the necessary psychomotor and interpersonal skills, and the ability to function in any given setting to effectively use available health care resources. Nursing is considered a stand-alone profession. For so long, nurses have been functioning under the shadow of doctors and following medical orders. It is still noticeable today and it cannot be denied that nurses and doctors are still very much the key players in a patient’s health care. However, nursing leaders are encouraging the medical profession that nurses should be given the opportunity to work independently, if needed, and not solely depend on the doctor’s directives. Without doctor’s orders, a nurse can still function and contribute to patient’s recuperation. In order to this, every nurse should be guided of the basic nursing interventions that can be done to almost any type of patient in any health care setting. Communication Skills. Nurses should pay attention to their patient’s clamors and constant demands. It can be an ordeal sometimes to listen and talk with a patient, especially if they are always complaining and demanding immediate attention. Then again, only by active listening and going down to the bottom of the conversation is the only way a nurse can understand patient’s problem. Promote Comfort and Alleviate Pain. Allowing the patient to experience pain is a mortal sin. There should not be a complaint of pain nor reports that a patient is uncomfortable while he is receiving medical care. if this happens, the nurse can assess and determine what causes the pain and provide nursing interventions to counteract this problem. Examples of nursing interventions include dimming the lights, position changes, offer pillow support, and diverting the patient’s attention away from the pain sensation. Fall Prevention. Almost all patients are candidates of fall injuries while in the hospital. In fact, fall injuries are among the most common incidents reported in the hospital. Therefore, nurses should always be on the look-out and critical on implementing strategies to prevent fall injuries. For example, ensuring that the call bell is within the reach of the patient, making use of non-skid socks if they are up and about, and be mindful of the medications that can cause drowsiness and confusion. Patients can also benefit from putting the side-rails up for safety. Promote Fluid Balance. All patients admitted in the hospital can dehydrate if not properly monitored. It is SOP to initiate intravenous fluid therapy to patients who are critical and requiring immediate medical intervention. While those who can take oral fluids, nurses should ensure that they meet the daily requirement of fluid intake to prevent fluid deficit. The foundation of an effective and quality patient care is when the nurse delivers safe, cost-effective, and evidence-based practice interventions generating a positive patient outcome. For every patient problem, there is a corresponding intervention that a nurse can offer either independently, by following a doctor’s order, or from other health care professionals’ directions. Nurses should always be guided by their knowledge, skills, interpersonal communication, and resourcefulness when carrying out an intervention. Butcher, H. K., Bulechek, G. M., Dochterman, J. M. M., & Wagner, C. (2018). Nursing Interventions classification (NIC)-E-Book. Elsevier Health Sciences. Moorhead, S., Johnson, M., Maas, M. L., & Swanson, E. (2018). Nursing Outcomes Classification (NOC)-E-Book: Measurement of Health Outcomes. Elsevier Health Sciences. Bouldin, E. L., Andresen, E. M., Dunton, N. E., Simon, M., Waters, T. M., Liu, M., Daniels, M. J., Mion, L. C., … Shorr, R. I. (2013). Falls among adult patients hospitalized in the United States: prevalence and trends. Journal of patient safety, 9(1), 13-7.